In Turkey, the locally-held PP market was on a softening trend since May this year while the consecutive discounts gained speed in recent weeks in line with the downturn in import prices and other global markets. 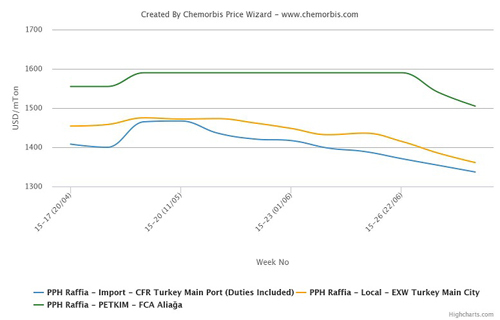 According to ChemOrbis Price Wizard, the distribution market declined nearly $90/ton on average since early June. The domestic producer Petkim joined the trend two weeks ago by applying its first decrease after five months of a bullish trend, which was followed by a second price cut this week. The movement from the seller sped up price reductions in the distribution market. Petkim’s total reduction has reached $85/ton since July started. 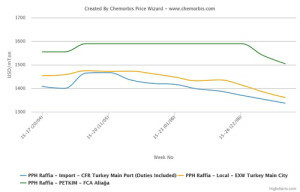 The locally-held PP raffia market indicates $20-50/ton decreases with respect to last week now that the low end broke below the $1600/ton threshold recently. The rumor was that materials that are on the way to the country started to be offered as low as $1580/ton late last week. Players cited poor demand from buyers amidst the still unclear political scene in the post holiday period as the main reason behind ongoing discounts. Many buyers are sidelined these days given widespread expectations for additional price cuts considering the lower upstream chain as well as bearish developments in China. PP prices witnessed further losses over the past week in that country due to plentiful supplies owing to new coal based capacities while a sharp downturn in Chinese financial markets also contributed to the downward pressure on prices. In the meantime, players have been reporting relatively diminished prompt PP raffia supplies for the last two weeks, according to ChemOrbis. Some participants question whether this situation can help the market narrow its losses or even stabilize over the medium term in the event demand returns after holidays.